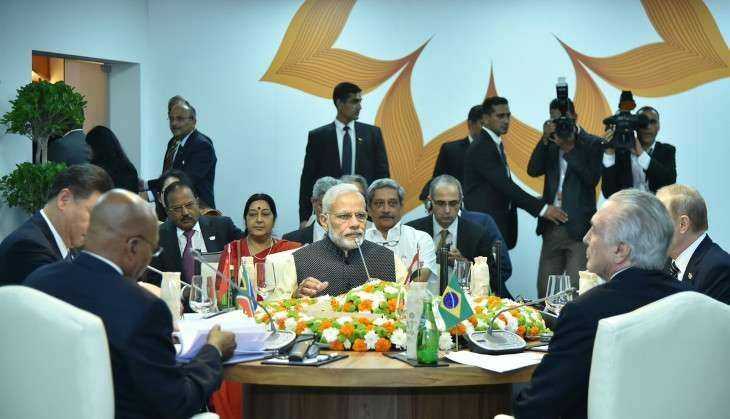 Prime Minister Narendra Modi, who addressed the BRICS leaders' restricted meeting on 16 October in Goa, made a strong statement against Pakistan and labeled it as the "mother-ship" of terrorism. He further said that Pakistan does not only shelter terrorists but also "nurtures" a mindset. Without naming Pakistan, PM Modi said, "the most serious direct threat to our eco prosperity is terrorism; Tragically, its mother-ship is a country in India's neighbourhood." He added, "Terror modules around world are linked to this mother-ship. This country shelters not just terrorists. it nurtures a mindset. A mindset that loudly proclaims that terrorism is justified for political gains. It's a mindset that we strongly condemn." The Prime Minister asserted that BRICS must speak in one voice and should stand together against this as "the growing arc of terrorism" posed a threat to Middle East, West Asia, Europe and South Asian countries. In a veiled disapproval of terror sponsored from across the border, India and Russia on 15 October strongly pushed for steps to deny safe havens for terror and called for an early conclusion of the Comprehensive Convention on International Terrorism (CCIT) by the UN to tackle the menace. The strong condemnation of terrorism in all its forms and manifestations came forth in a joint statement issued by the two countries after PM Modi held wide-ranging talks with Russian President Vladimir Putin, an engagement that took place against the backdrop of the Uri attack and the subsequent surgical strikes. At a joint press briefing, Modi conveyed to Putin his appreciation of Russia's unequivocal condemnation of the Uri attack during their talks on terrorism, including that emanating from Pakistan.